Well this morning started early as I wanted to sort through my vintage ribbon and wool thread jars. I needed to pack some bits to stitch and one of the things that I need to do for a project is embroider some vintage ribbons with some flowers, so I thought that would be an easy pack as it is very light for travelling. I found the lemon colour I was looking for and also had a good old look at some I bought from Donna Flower at the fair in Wimborne at Deans Court last year .... These on the right are the blue ones that are particularly beautiful I think. I like glass jars for cotton reels, threads, wool threads, needles and ribbons ... this makes them visible and easy to get at. Anyway I sorted some ribbons and threads out for one thing to take along with some embroidery on linen. I am going to finish any initial machine stitching so that it is just ready to put into a hoop. I have lots of different size embroidery hoops and I put them all together in size and tie with a ribbon then hang them up. They are hung on the back of the door. I know where they are and it keeps them very neat and tidy and then they can not bend out of shape at all. I have some vintage threads ready and these, although not embroidery silks, are cotton, I sometimes use cottons to embroider fine detail so I had to sort some of those out this morning too. 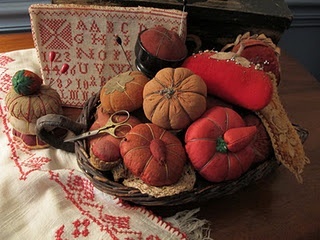 vintage pin cushions and embroidery .... Oh sigh!